This is the paper that I presented at the Related Histories: Studying the Family conference, held at the National Library of Australia on 29 November 2017. If you’re interested in knowing more, Caitlin Adams from Macquarie University has written a review of the Related Histories conference. Since the 1990s, the field of Chinese Australian history has been characterised by the active participation of family and community researchers alongside academic historians, museum curators and heritage professionals. Over the same period, digital technologies have changed the ways that we communicate and how we do historical research. In this paper I consider questions of communication and collaboration between academic and family historians in the digital age, based on my work in Chinese Australian history. Working with family historians and descendants over the past two decades has shaped my practice as an academic historian, in particular in thinking about who I write for and why. In the paper I will discuss some of the ways I have made my work accessible and actively engaged with family historians, particularly in the digital realm, and contemplate the benefits and challenges of doing so as an academic historian today. My contribution to this panel on ‘family history and the digital revolution’ is going to be something of a personal reflection based on my participation in the field of Chinese Australian history over the past two decades – a period that both starts and ends with me in the academy. Then, twenty years or so ago, I was a PhD student at the University of Sydney. Now, I’m an ARC DECRA Research Fellow at the University of Wollongong. In between, there was a good decade or so in which I held no academic position or affiliation. I worked at the National Archives for about seven years, then in editing and publishing in the public service here in Canberra, and then as a freelance editor and historian-for-hire, completing projects for AIATSIS and DFAT among others. All the while I maintained my scholarly research practice as best I could around this paid work and family life. I wrote papers, presented at academic conferences, and published in peer-reviewed journals and edited collections. In 2016 I was awarded a DECRA fellowship, and so I now find myself back in academia. In the two decades in which I have been a historian, digital technologies have radically changed the ways that we do history – as academic, community or family historians. These technologies affect every aspect of historical practice – most obviously in the ways that we find and access archival and library collections online, but also in how we can interact with, analyse and understand those collections; and in how we can present and communicate our work. 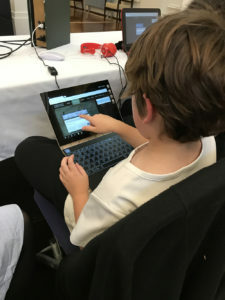 Digital history – ‘gathering, preserving and presenting the past on the web’ as Dan Cohen and Roy Rosenzweig described it – democratises history by inviting and encouraging the participation of non-academic audiences. It makes historical knowledge more accessible to the public and multiplies the number of people who participate in making history. It also facilitates investigation, curiosity, participation and connection building around historical knowledge and historical collections. One thing that has struck me after moving back into academia last year has been the reaction of my university colleagues to my use of the web and my outwards focus as a historian – the fact that I blog and I tweet, that I make time to give talks and workshops to family historians and other non-academic audiences, and that I would rather my work be accessible than locked behind the paywall of a ‘prestigious’ international journal. In my paper today I would therefore like to reflect on how I think working with family historians and descendants over the past two decades has shaped my practice as an academic historian, and consider how digital technologies have created opportunities for communication and collaboration. I’ll discuss three examples: first, publishing my work online; second, running a heritage study tour to China; and third, developing an online archival transcription project. Working in field of Chinese Australian history, people often ask whether I have Chinese heritage – not an unreasonable question considering that much of my work has focused on mixed-race Chinese-European families. The short answer to that question is ‘no’, but there is one family connection that I do quite like to highlight. My paternal great grandparents, Harry Bagnall and Florence Bellamy (both migrants to New South Wales – he from Dudley in England and she from Dunedin in New Zealand), were pioneers in the sport of cycling in Sydney in the 1890s. In 1892, Florence was one of four women elected as honorary members of the Sydney Bicycle Club, ‘in consideration of their being the first ladies in Australia to take up the pastime of cycling’ (Evening News, 21 May 1892, p. 5). Florence met Harry through their mutual interest in cycling. He was an active member of League of Wheelman and competed professionally in the mid-1890s. 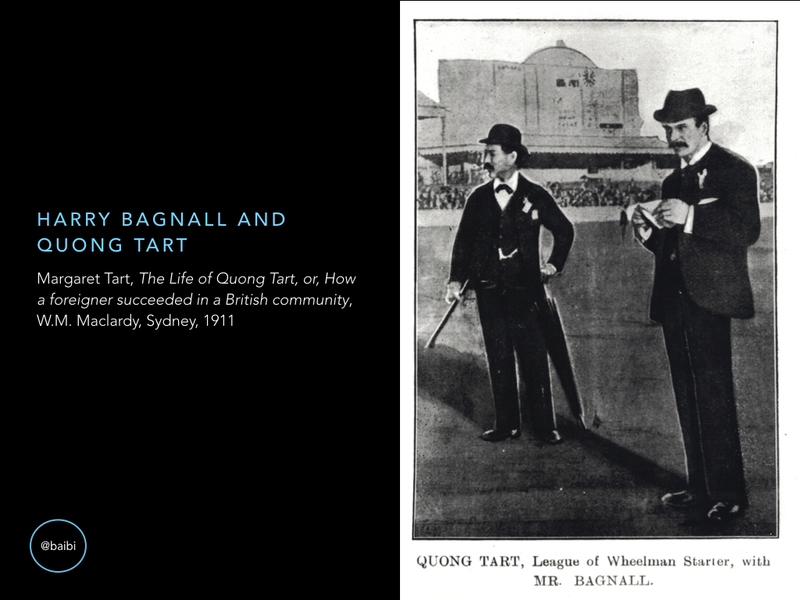 Another migrant to New South Wales, one who had arrived a good three decades before my great grandparents, was also involved in the League of Wheelman, and that was Sydney merchant Quong Tart. Cycle club meetings were held in his tea rooms in King Street and Quong Tart was for some years a starter at League of Wheelman races. 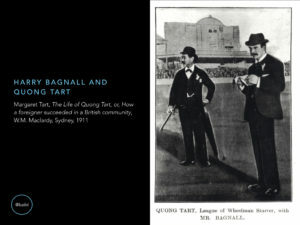 Margaret Tart’s biography of her late husband, published in 1911, includes a photograph of Quong Tart and my great grandfather officiating at a race meeting together. That is my historical family connection to Chinese Australian history! My interest in Chinese Australian history therefore did not come from my own family history, but it did emerge out of personal experience. 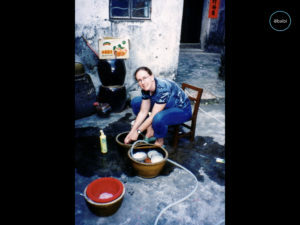 Twenty years ago, in 1997, after finishing Honours in History at Sydney University, I went to teach English in China for a year, in the small coastal city of Zhuhai, just across the border from Macau and an hour by ferry from Hong Kong. Zhuhai is in the Pearl River Delta region of Guangdong province, and it was from the Pearl River Delta, through Hong Kong, that most Chinese immigrants came to Australia in the nineteenth and early twentieth centuries. Having fallen in love with the language, culture and history of south China, when I returned to Australia to begin my PhD, I sought a topic that might combine this new love with my existing love of Australian women’s history. And so, under the supervision of Penny Russell, I began researching the history of Chinese families in colonial New South Wales. What I found when I began that research was that the existing scholarship on the Chinese in Australia, including works written by academic historians, discounted the existence of Chinese families in colonial Australia – in part because of the small numbers of Chinese women who migrated at that time, and in part because of the assumption that white Australian women and Chinese men didn’t form families together. Failing to critically examine their sources, scholars repeated and compounded colonial thinking about the sexual, social and family lives of the Chinese in Australia. After mining the footnotes of these earlier historians for sources – this was well before the days of Trove, remember! – it was pretty clear why they had this impression of Chinese Australian family life. The government reports and inquiries, parliamentary debates, and articles from the metropolitan daily press they cited spoke about ‘the Chinese’ as an anonymous group, rarely mentioning individual Chinese, other than those of wealth and community standing like Quong Tart or Louis Ah Mouy. These sources did, however, mention here and there a Chinese man with a European wife, or a European woman living with a Chinese man, or the presence of Chinese-European children. 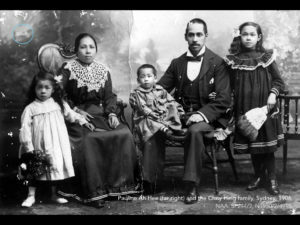 So I went looking for material about these families elsewhere – in published local and community histories, in the collections of local history and family history societies, in birth and marriage records, and in immigration records. I also sought to make contact with descendants. For me as a young historian, contact with descendants and family historians was important for a number of reasons. The first, simply, was to try and locate names and biographical information about the Chinese-European families who were the focus of my study. I wanted to know who these people were, where they lived, how they met, and what their lives were like – research that is remarkably hard to do without a name. The second, where I already knew names and had some information from the archives, was to form a more rounded picture of their lives, to understand more about them than the official record might tell. Over time, a third reason emerged, and that was to be able to share what I knew and what I had uncovered in the archives, both about their families in particular and more generally about Chinese Australian family life. While many of the family historians I met had done the most extensive, fastidious research – as they do – Chinese ancestors were often a puzzle. Many had not known of their Chinese ancestry before digging into the family history, and I began to be able to provide a broader understanding of the context of their ancestors’ lives in both Australia and south China. The questions that family historians asked me also pushed me to find answers. I’ll give you one example. About 18 months into my PhD I made contact with a lady named Marlene from Lane Cove whose great-grandmother, Harriet Bourke, had married Thomas Ah Cue in Forbes in 1881. One of their daughters, Susan, born in Forbes in 1882, married a Chinese man named John Lee in 1899. 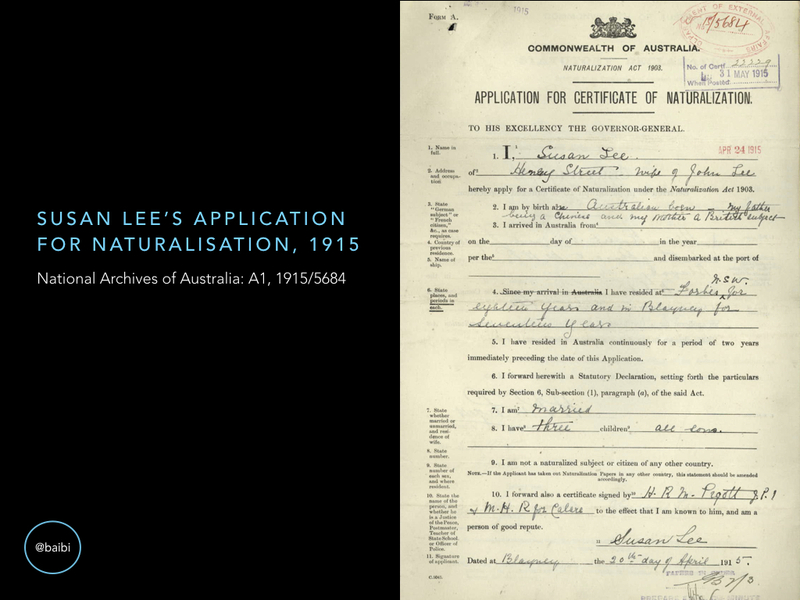 Among the family documents Marlene had located was the 1915 naturalisation certificate of Susan Lee, and she asked me why Susan, who was born in New South Wales and was therefore a British subject by birth, had taken out naturalisation. At the time, I didn’t really know the answer, but it prompted me to find out. And I’m pleased to say that I now have a PhD student, Emma Bellino, who is writing her thesis on the topic of marital denaturalisation, focusing on Australian women who married non-European aliens in the early 20th century. At the same time as making contact with these family historians, I found a community of researchers working in the field of Chinese Australian history whose backgrounds stretched across academic history, archaeology, heritage, the GLAM sector, and community and family history. 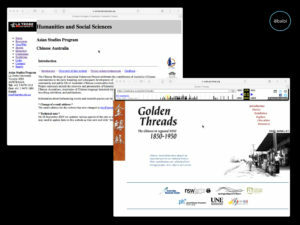 This community of researchers provided me with models of how good, scholarly history could take different forms and be presented for different audiences – I’m thinking here of the Golden Threads project run by Janis Wilton at UNE and the Chinese Heritage of Australian Federation project run by John Fitzgerald, then at La Trobe. Among their outputs, these two projects produced websites with publicly accessible databases and other online resources. 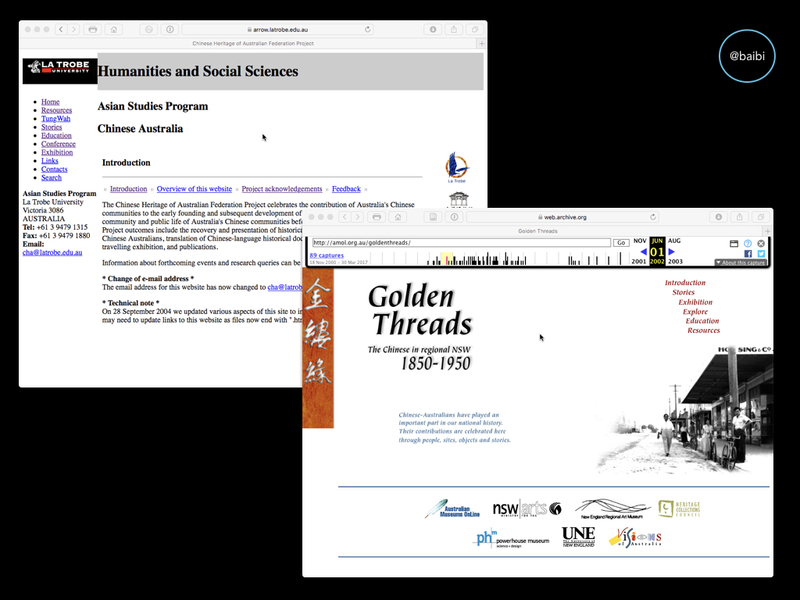 Although time has not served these project websites well – the Golden Threads website no longer exists except in Pandora and the Internet Archive, and the CHAF website exists in a semi-functional ‘archived’ form hosted by the La Trobe University Library – they were both exemplary Australian digital history projects of their time. In this Chinese Australian history community I also found my good friend and collaborator, Sophie Couchman. 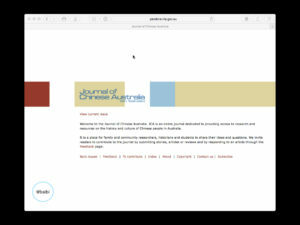 One of our first joint enterprises, along with a couple of other history postgrads, was the creation of the online Journal of Chinese Australia. The journal only lasted two issues, in 2005 and 2006, but I think our aim for the journal still epitomises the approach that Sophie and I take in our work. We hoped the journal would provide ‘access to research and resources on the history and culture of Chinese people in Australia’ and be ‘a place for family and community researchers, historians and students to share their ideas and questions’. For the rest of my time I’d briefly like to share with you three more recent examples of how I have engaged with family historians in both the digital and non-digital worlds. Making my work available online has had a profound effect on my interactions with family historians and the research community more broadly. I decided when I finished my PhD in 2006 to make my thesis accessible online through the University of Sydney’s online respository, and a couple of years later, in August 2008, I started a blog, giving myself a visible presence online. More recently again, in March 2009, I began using Twitter, which I use ‘professionally’ rather than ‘personally’, although there’s quite a deal of overlap between the two. Where possible, too, I now either publish my ‘academic’ work in open access publications or negotiate to be able to put a copy of my final article or chapter online through my website. I want my work to be read by the people I write it for – and many of them don’t have access to scholarly journal databases or university libraries or have the money to buy $150 books published by international presses. One of the most common ways that people have found my work is when they Google their family name as part of their family history research. 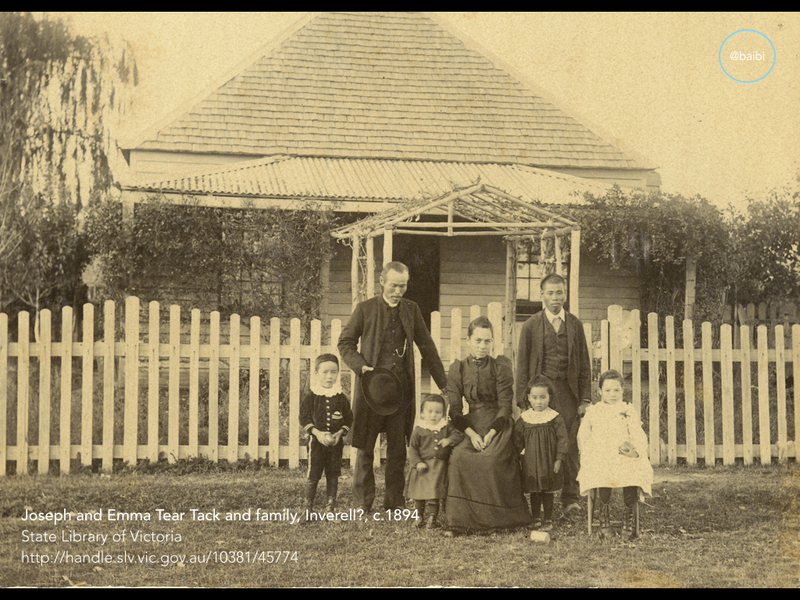 My thesis includes stories about many families, and has two appendixes – one of Chinese-European marriages in colonial New South Wales, and one of Chinese-European families who travelled to and from China before 1930. It therefore includes lots of names, although as I am continually discovering, there are still many, many families I have never heard of! I am so grateful that this part of our history has been researched and brought to light … I am so touched to finally feel that I might be about to discover something from a heritage that has been hidden and denied. It was all generations ago and my family has almost no stories or clues, and yet … to read about the experiences of similar families is exciting and promises a connection that has felt lost until now … Knowing [your thesis] exists is somehow something I find comforting, and I wanted to reach out and say thank you. That is the sort of thing that really makes my heart glow as a historian! Some of these contacts have helped me solve puzzles too. The story of Pauline Ah Hee is one example. One of the groups of Chinese-European children I wrote about in my thesis were children who were in state care or adopted. Among them was a beautiful child named Pauline Ah Hee, born Dubbo in 1893, who was adopted by James and Fanny Choy Hing in Sydney. 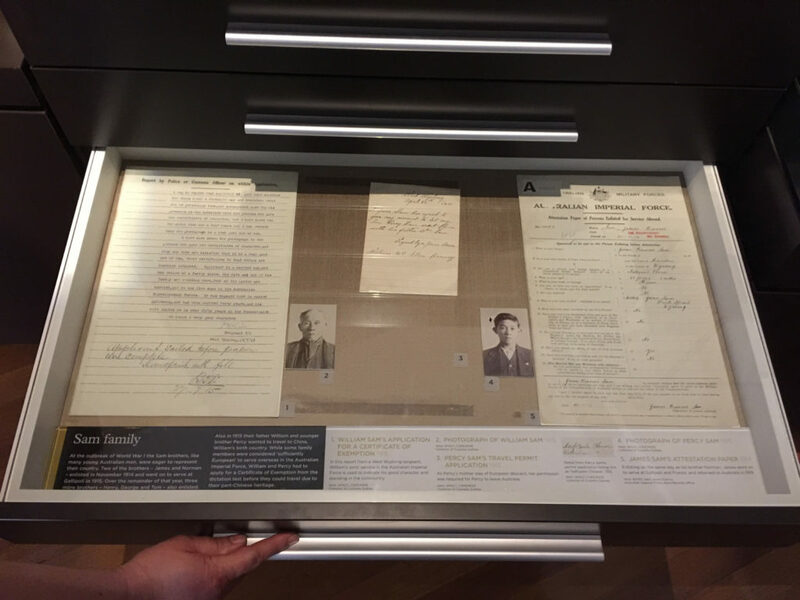 Based on a Customs file held in the National Archives in Sydney I wrote about Pauline in my thesis, pondering about her role in her adopted family. James and Fanny had children of their own, and I wondered why and in what circumstances they had taken Pauline into their family. In 2011, I got to know Howard, whose wife is the granddaughter of James Choy Hing and the niece of Pauline Ah Hee. Howard had heard me speaking on our local ABC radio here in Canberra and looked up my thesis online. 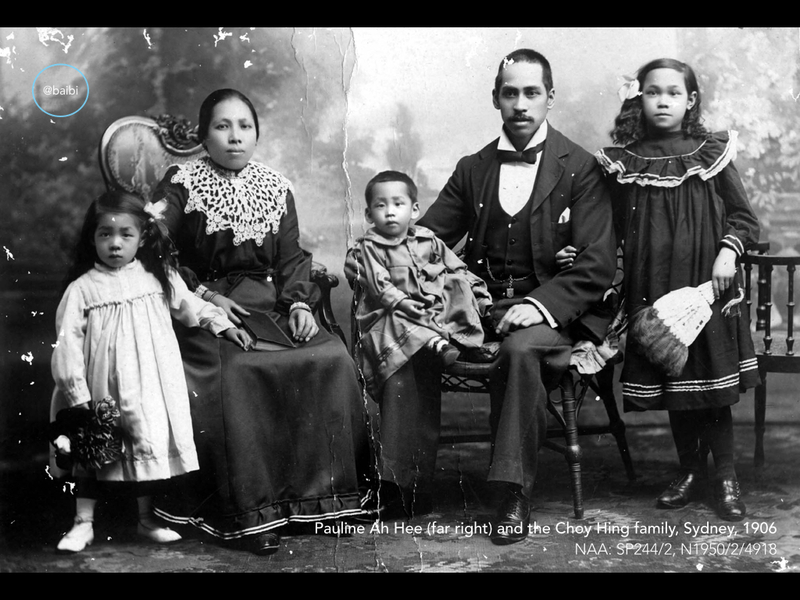 My mention of Pauline and the Choy Hing family spurred him on to research that part of the family history, and in time he shared with me what he had uncovered about Pauline’s life. Howard told me that after her adoption Pauline was raised as a true daughter of the family, living as part of the wealthy Choy household in Hong Kong after the family’s return there. When I went to live in China in 1997 it was by lucky coincidence that the city I lived in, Zhuhai, was in the heart of the ancestral homelands of Australia’s early Chinese migrants. At that time, Zhuhai was still very much a Cantonese city – some of the city’s residents are from families that had lived in the area for generations, while many others had migrated from districts around Pearl River Delta after Zhuhai became a Special Economic Zone in the early 1980s. Thanks to the friendships I made that year, I was welcomed into family homes and taken on visits to ancestral villages in the countryside, I celebrated traditional festivals like Chinese New Year and Qingming and took part in significant family events like weddings, new baby celebrations (满月 múhn yuht) and a funeral. The history, culture and language of the Pearl River Delta districts are very special and I feel really privileged to have been able to experience life there in the way that I have. 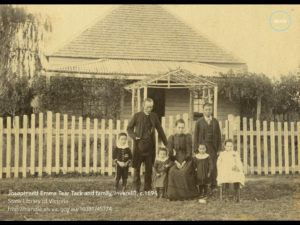 So, as I came and went from China in the years that followed – on holiday, to study, to do research – and as I spent time here with Chinese Australian family historians, I realised that many Australian descendants wanted to go and visit their Chinese ancestral homes, but didn’t know how to go about it, particularly because they spoke no Chinese. For many, too, there was insufficient information to trace their Chinese ancestor back to a particular place, other than the ubiquitous Canton. 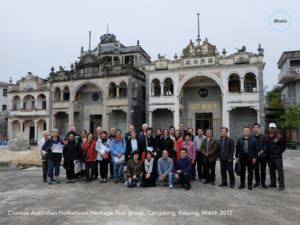 So this year, after many years of quietly plotting in my own mind and a couple of years of serious organising, Sophie Couchman and I led our first Chinese Australian Hometown Heritage Tour to Hong Kong and Guangdong. The tour ran for ten days, beginning and ending in Hong Kong. In China proper, we visited museums, heritage sites and ‘Australian’ villages in six Pearl River Delta counties. Our sixteen guests came from New South Wales, Victoria, Queensland, Tasmania and New Zealand, and most were descended from early Cantonese migrants to Australia. During the tour we visited a number of their ancestral villages, something that was very special for us all. We also ate a tremendous amount of excellent food, including the best egg tarts I think any of us have ever had. Until this year, I tended to think of him as ‘the Chinese guy’. When I travelled to China with the other Chinese descendants … my attitude changed. Suddenly, he was a real person, my ancestor, my great-great grandfather, and loving husband to Sarah and father to six children. Another participant from our 2017 tour is even coming back to join us for our next tour in January 2018. We’re also really pleased that two of the participants in our upcoming tour in January are PhD students whose doctoral research draws on their own Chinese Australian family history, in Darwin and country Victoria. 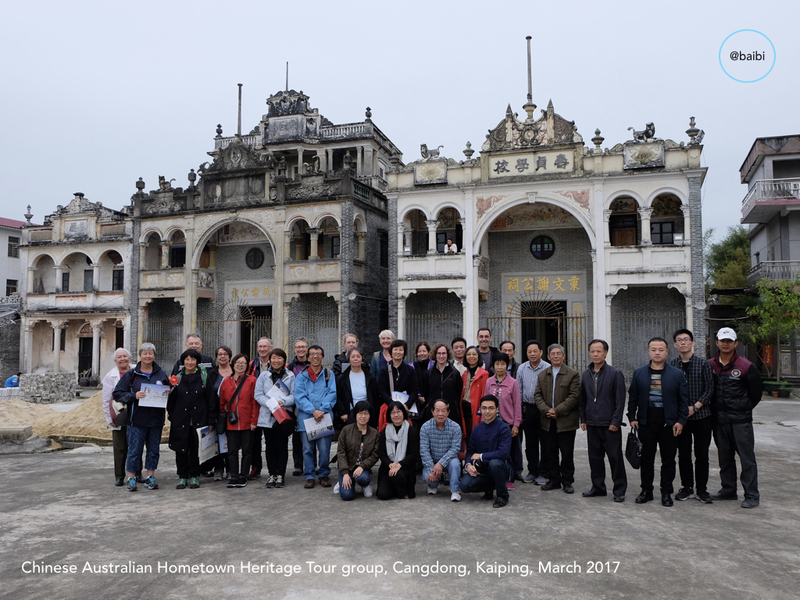 For me, it’s really exciting to see the possibilities that these personal experiences in the ancestral homelands in Guangdong might bring to a new generation of Australian histories. 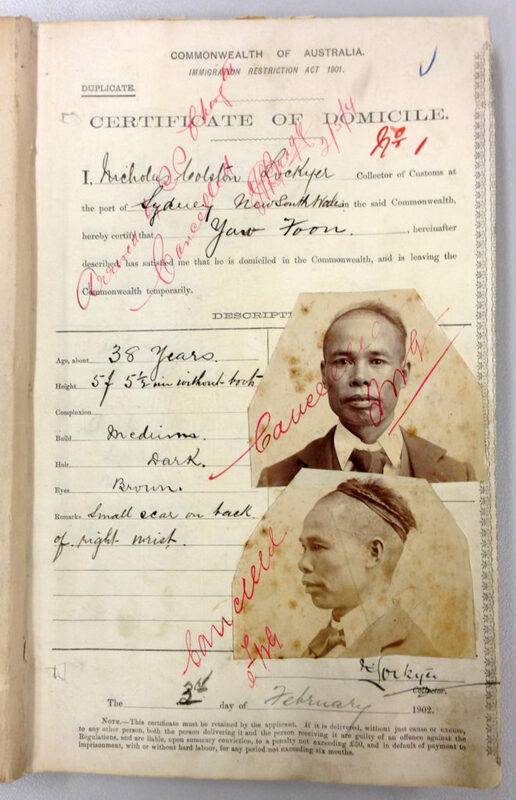 One of the most significant sources for writing Chinese Australian history are the many thousands of Customs and Immigration files about Chinese Australians held by the National Archives of Australia. 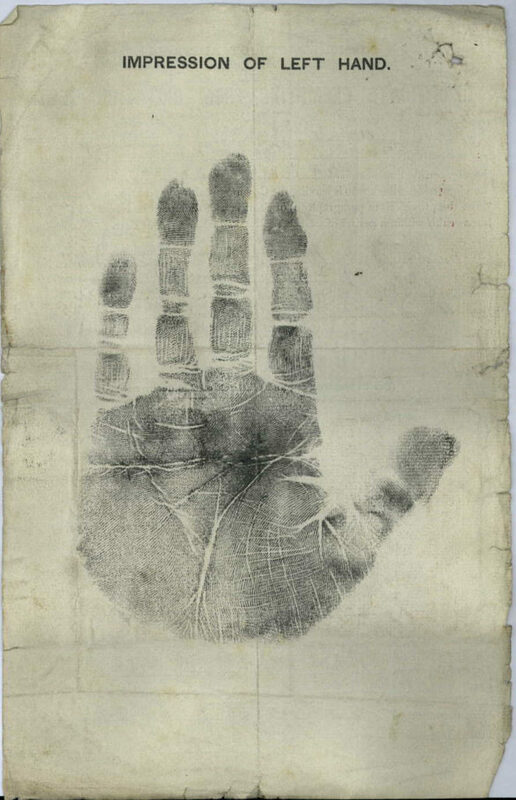 These records were created in the administration of the Immigration Restriction Act and include, among other things, about 40,000 identification documents called Certificates of Domicile and Certificates Exempting from the Dictation Test, which date from the turn of the 20th century to the 1950s. Since the early 2000s, the National Archives has undertaken substantial arrangement and description and digitisation work on various of these record series, meaning that they are a lot easier to find and access than when I first looked at them as a PhD student twenty years ago. Individual records across multiple record series can, for example, now be easily located using a name-based keyword search in the National Archives’ collection database, RecordSearch, and digitised copied viewed online. This year I have been working with University of Canberra historian Tim Sherratt and his digital cultural heritage students on an online project, called the Real Face of White Australia, that aims to transcribe data from these identification documents. 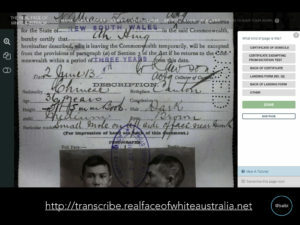 Like the Hometown Heritage Tour, this project has had a long germination – from my various low-tech efforts at extracting personal data from the certificates to Tim’s very high-tech use of facial detection technology in his creation of the Real Face of White Australia experimental browser in 2012. The transcription website that Tim has built uses the power of crowdsourcing to extract structured data – like names and biographical information – from the documents, data that can then be used for future research. As the project progresses Tim will release the data online so that anyone can use it, not just us. I’d encourage you to have a go at transcribing – it’s pretty fun! There is a lot more that I could say about the project, but I will focus on two things with a family history perspective. 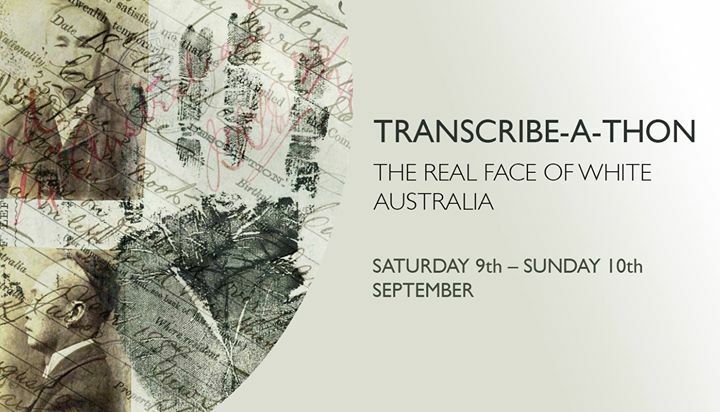 To launch the project, we held a transcribe-a-thon weekend at the Museum of Australian Democracy at Old Parliament House, where we and Tim’s students and members of the public sat and transcribed all weekend. Being an online project, though, it wasn’t just those of us physically in the building who took part in the weekend’s activities. One of our China tour participants set up his own mini transcribe-a-thon at home in Melbourne, where he and his family sat around the dining table working away at transcibing the records on the Saturday night. 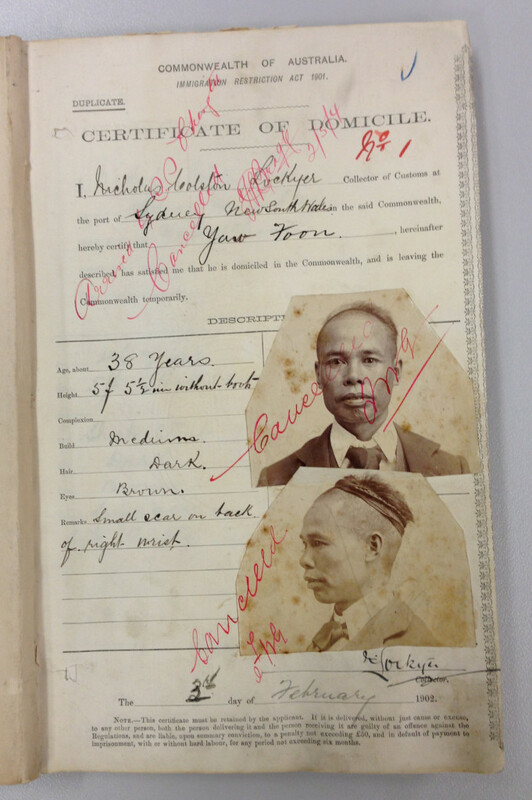 He is now also working with Sophie Couchman on developing a similar transcription project for a significant set of Chinese immigration registers held in the Melbourne office of the National Archives. My final example is something that I, as a mum, think is probably the best thing to have come out of the whole project. 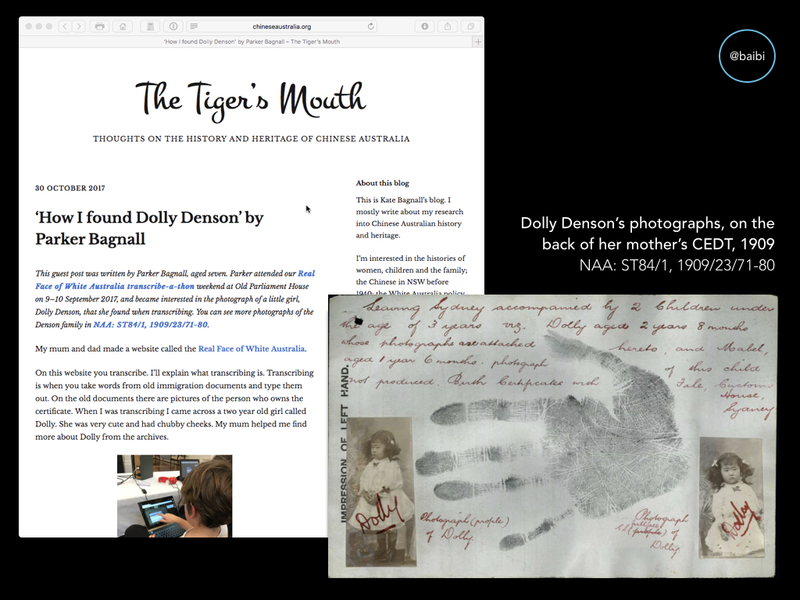 Tim and my seven-year-old daughter, Emily, really got into transcribing the records during the transcribe-a-thon, and in the records she came across the photograph of a little Chinese Australian girl named Dolly Denson from 1909. Emily was so taken by Dolly’s picture that she wanted to find out more about her, so together we did some more research and, over the last school holidays, she wrote a blog post about her discoveries (using her nom de plume, Parker). 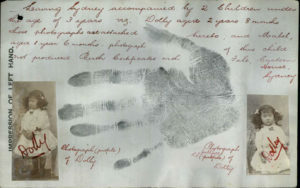 Since the post went live on my blog, three of little Dolly Denson’s relatives – two of her nieces and a grand niece – have written lovely comments in response. How good is that? Engaging with family historians and descendants over the past two decades had given me a very concrete sense of why I do what I do as a historian. Yes, I’m a historian because I love being a historian – like many of us, I may well be my happiest when I’m buried in the archives – but I’ve also kept being a historian through those lean years when it wasn’t what I was paid to do because I feel like my research makes a difference to people. In the world of academic history I hope my work shifts our understanding of the place of Chinese Australians and Australia–China relations in the broader narrative of Australian history. In the world of family history, I hope that my work contributes to people’s understanding of their own family histories and how their ancestors lives fit into the bigger story of both Australian and Chinese history. These family stories are not always easy ones to uncover or understand, and they can be very emotional to research – but they are important and they deserve to be told. Although this session was about ‘family history and the digital revolution’, you can see from my examples that my engagement with family historians is not all about being digital – the tangible and the face to face are still important. In my experience though, there are many positive things about working online, not least of which is the fact that it scales up the possibilities for participation, communication and collaboration between academic historians and family historians. Five years ago I began an as-yet-uncompleted series of blogposts about the various iterations of the Certificate of Domicile and the Certificate Exempting from the Dictation Test. In the first post I wrote about the first Certificate of Domicile held in record series NAA: ST84/1, ‘Certificates of Domicile and Certificates of Exemption from Dictation Test, chronological series’. The certificate, no. 1903/1, was issued to a man named Ah Shooey on the last day of 1902. The reason I didn’t write about the very first Certificate of Domicile issued in New South Wales was because it is held in a different series, NAA: SP11/6. I’ve written a bit about SP11/6 before — it’s an odd collections of Customs files that includes a bound volume with the earliest Certificates of Domicile, and the volume isn’t digitised. 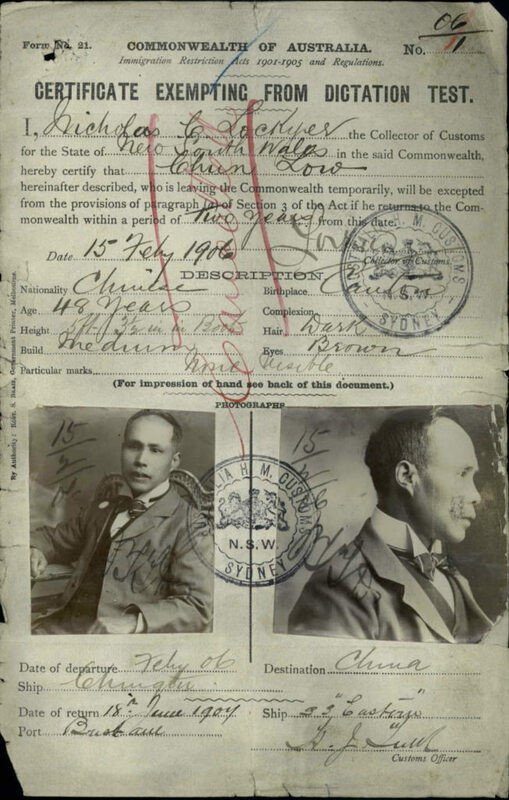 On a more recent visit to the archives in Sydney, I therefore photographed the first certificate, which was issued a month after the Immigration Restriction Act came into force in January 1901. It can be found in NAA: SP11/6, Box 3. 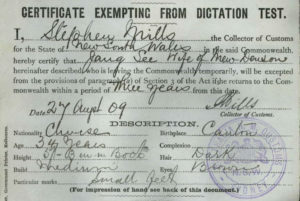 The first NSW Certificate of Domicile was issued to 38-year-old Yau Foon (or Yaw Foon or Yow Foon?) 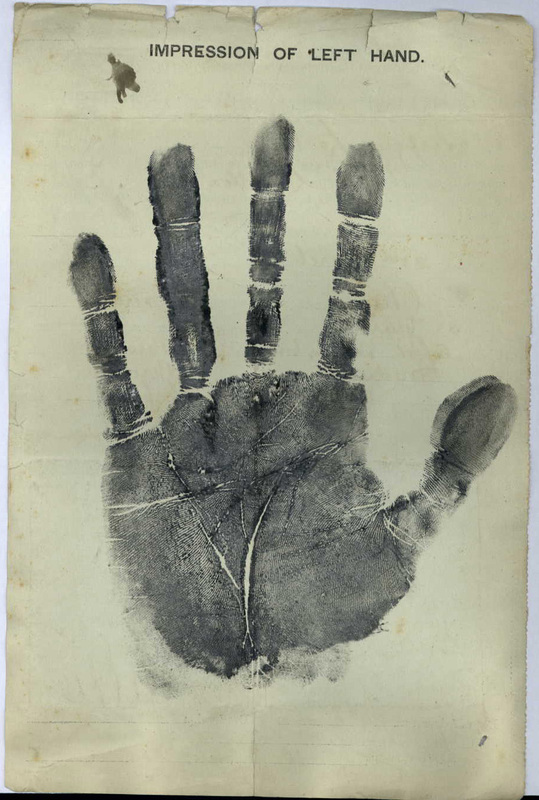 on 3 February 1902 by NSW Collector of Customs Nicholas Lockyer. On the certificate ‘No. 1’ is handwritten in clear red letters at the top. Yau Foon is described as being 5 foot 5 1/2 inches tall (without boots), of medium build, with dark hair and brown eyes. He had a small scar on the back of his right wrist. 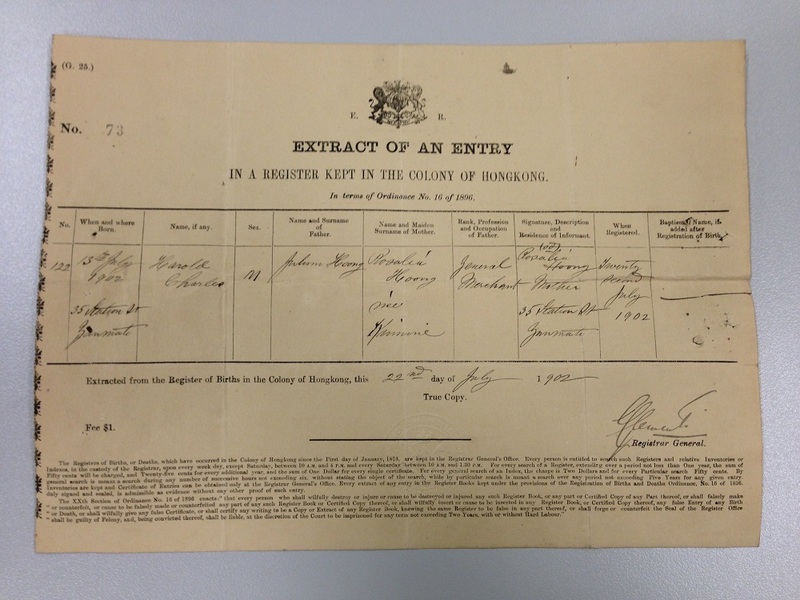 There is no space on the certificate for details such as nationality or birthplace. Two photographs are attached to the front of the certificate, one showing Yau Foon front on, one side on. The photographs clearly show Yau Foon’s queue, wound and pinned to the top of his head. 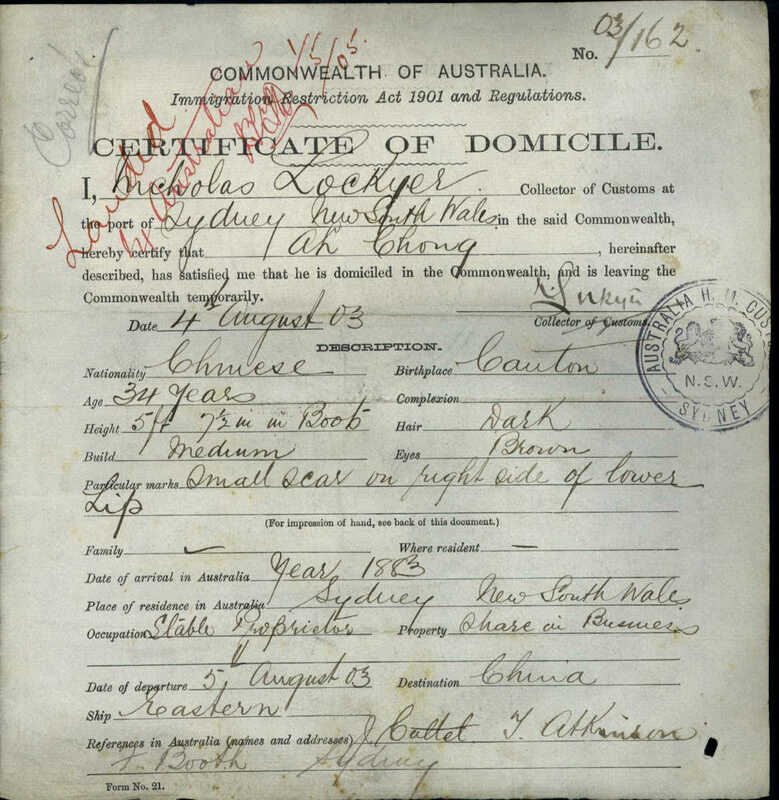 Note that on this earliest version of the Certificate of Domicile there appears to be specific spaces for two photographs. The certificate is marked in red as being cancelled, which would have happened when Yau Foon returned from his trip to China. 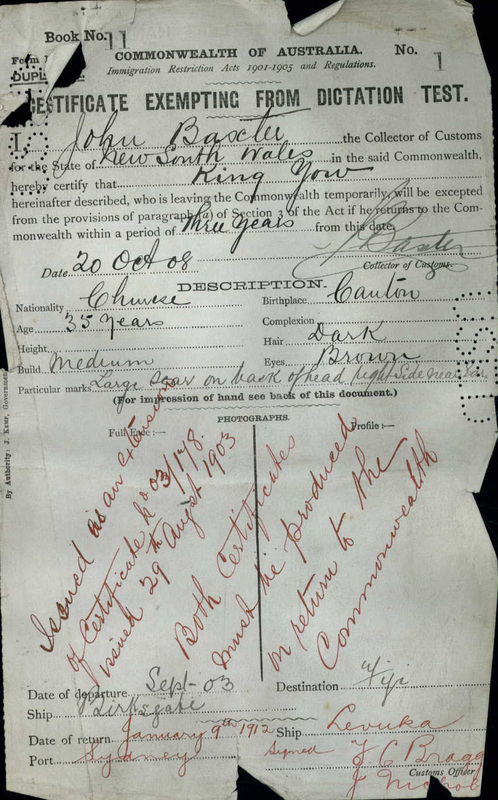 Customs officer Bragg has written that Yau Foon arrived on the S.S. Chingtu on 5 May 1904. I spent today at the National Archives in Sydney, looking at records for my Paper Trails project. My helpful reference officer, Judith, had warned me that there were 77 boxes in SP115/1, the series I need to look through. On my arrival though she told me she’s miscounted and there were, in fact, about 140. I managed to get through about 28 today. I’ll be there for the rest of the week but I’m not sure I’ll get through the remaining 112 boxes in the next two and a half days! Series SP115/1 contains documents relating to non-white people – mostly Chinese, but also Syrian, Indian, Japanese and others – arriving into Sydney between 1911 and the 1940s. The series is arranged by ship, with each item relating to a particular voyage. Although I’ve looked at particular items in this series before, this time I’m starting at Box 1 and looking through every file, all 1780 or so of them. You may well ask why. 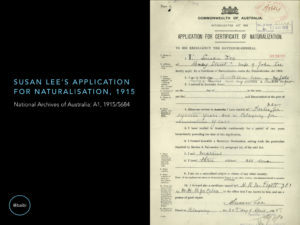 Although most of the documents in the series are CEDTs, which can also be found in other series (mostly ST84/1), the papers relating to Australian-born Chinese are often unique and unable to be found elsewhere. 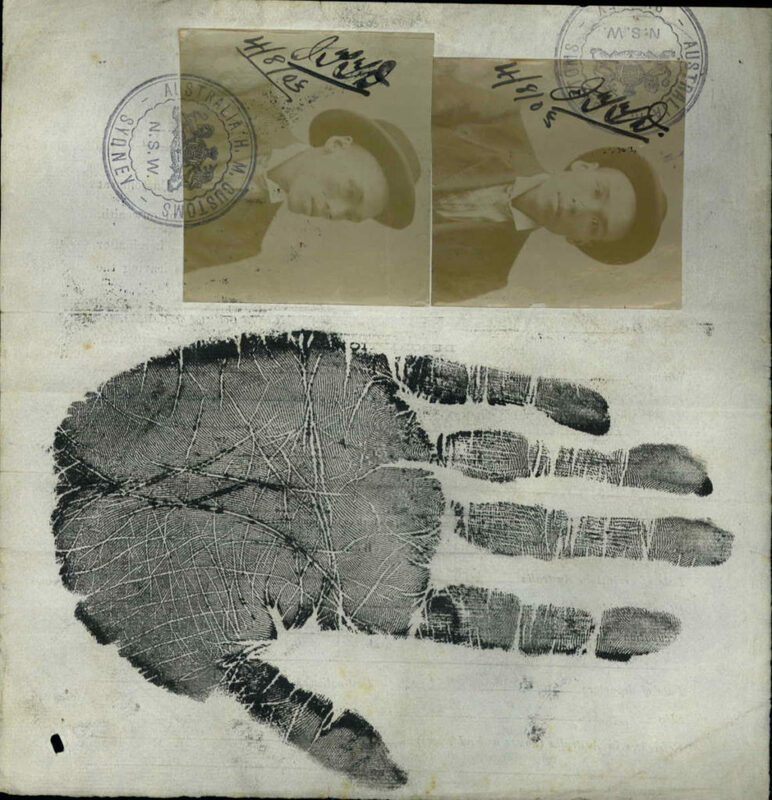 Details about these individuals might be recorded in the Register of Birth Certificates (SP726/2), but the documents in SP115/1 can include original birth certificates and other statements about identity and family background. 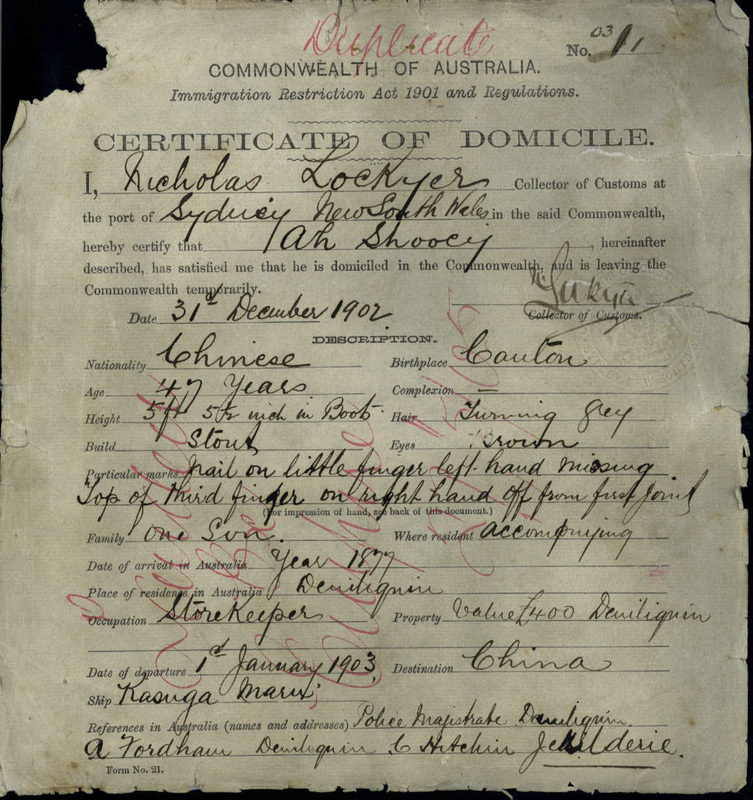 One nice find today is the 1902 Hong Kong birth certificate of Harold Hoong, son of Julum Hoong and Rosalie Kinnane, who were living in Yaumatei at that time (NAA: SP115/1, 04/02/1915 – PART 1). 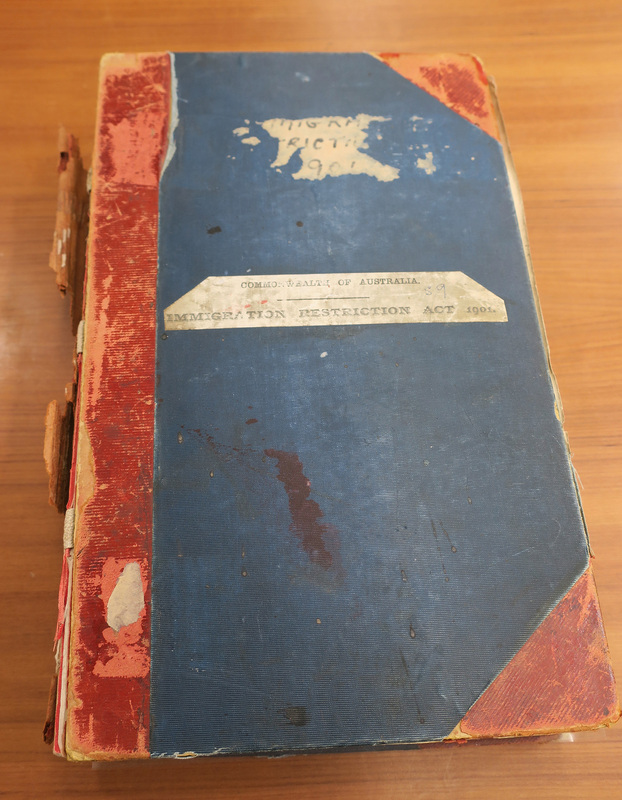 Early Hong Kong birth and marriage records were destroyed during World War II, so it’s nice to see one safe and sound. Other records relate to Harold’s Australian-born siblings William, Albert and Frederick. 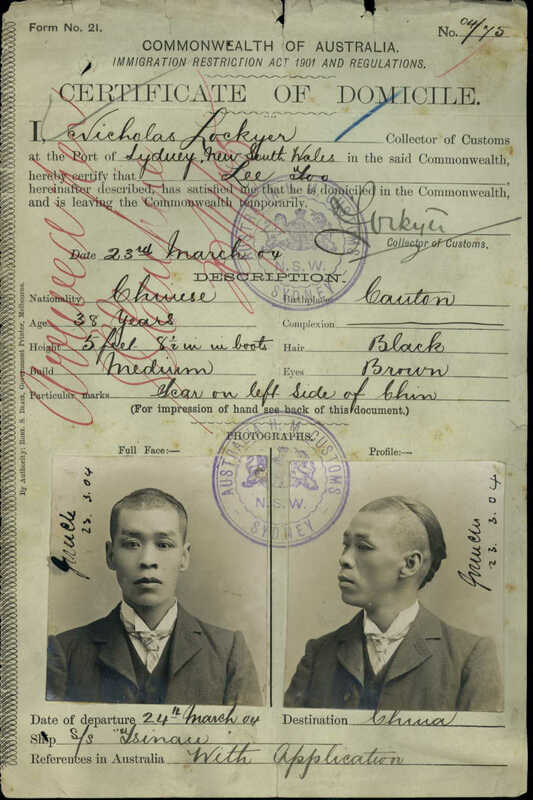 As well as locating documents about Anglo-Chinese travellers I know about from earlier research, looking through the whole series is yielding people I haven’t encountered in other records. Today I’ve found about half a dozen new subjects – some from families I’d already identified, but others are completely new to me. Exciting. I’m also making a record of all the Australian-born full Chinese (for my Threads of Kinship project) and any Chinese-born women (for a paper I’m working on about Chinese wives in early 20th-century Australia). Yesterday I spoke at Visible Immigrants Seven, a small conference organised by Flinders University and the Migration Museum in Adelaide. The conference aimed to explore the idea of migrant mobility before and after the major act of migration. 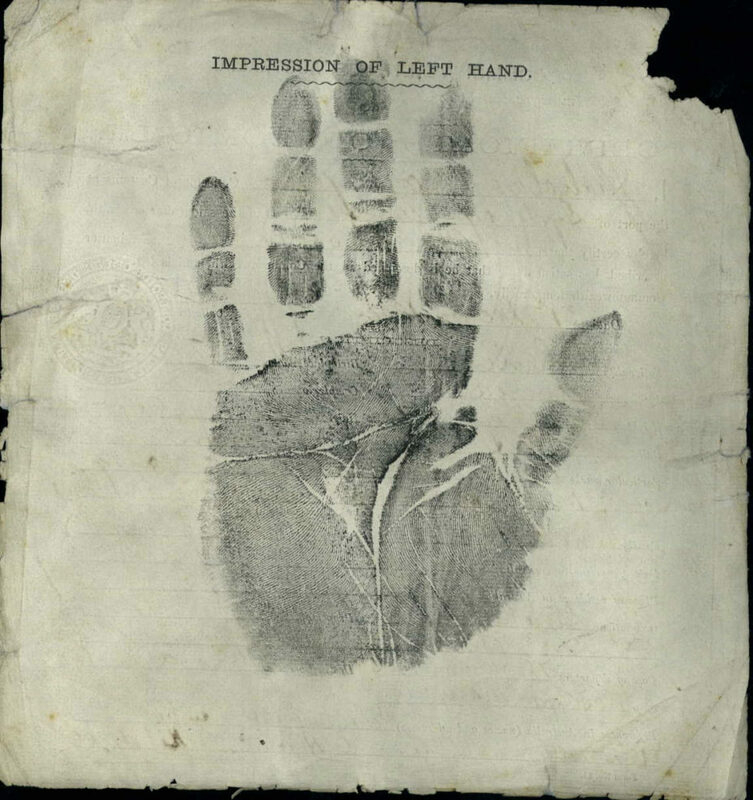 Most of the papers focused on nineteenth-century migrants from Ireland, Scotland and England, including convicts. My paper looked at the return migration of Chinese men and their Australian families.